Costa Luminosa is a cruise ship, owned and operated by Costa Cruises, and at the moment under the supervision of Captain Massimo Callisto Garbarino. Costa Luminosa entered service on May 5, 2009. The ship’s design is a Hybrid, taking the best elements of Spirit-class and Vista-class cruise ships. A sister ship, Costa Deliziosa was launched in February 2010 and is based on the same design. 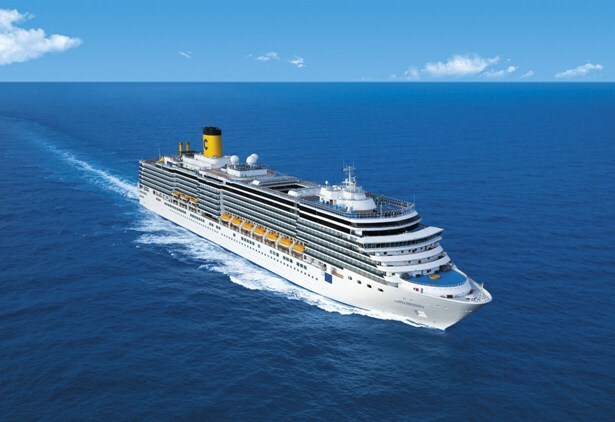 Costa Luminosa departed Civitavecchia, Italy on June 3, 2009, on her 13-night maiden voyage, with ports of call in Savona, St. Tropez, Barcelona, Lisbon, Le Havre and Amsterdam. Costa Luminosa made her maiden call at Harwich International Port in June 2009, just days after her official naming ceremony in Italy. Spirit class – a similar class of Panamax ships operated by Carnival Cruise Lines. MV Arcadia – a similar Panamax ship operated by P&O Cruises. MS Queen Victoria – a similar Panamax sized ship operated by Cunard Line. Captain Massimo Callisto Garbarino, aboard Costa Luminosa in June 2009 presented with a book celebrating the 60 years of Costa Cruises. During the 2009-2010 winter season, the ship operates in Dubai, offering 7-day cruises in the Persian Gulf with calls at Dubai, Muscat, Fujairah, Abu Dhabi and Dubai, Muscat, Fujairah, Abu Dhabi and Bahrain, but after the political problems in Bahrein, the company changed the itinerary removing the Bahrain. On Wednesday, December 14, 2011 in ROAD TOWN, Tortola (Virgin Islands) the Territory played host to the Italian ship Costa Luminosa making its inaugural call docked at the Cruise Pier with Premier and Minister for Tourism Dr. Hon. D. Orlando Smith officially welcoming the Captain Massimo Callisto Garbarino, his crew and passengers. The Costa Luminosa, which means ‘bright’, will grace the Territory every week for the 2011-2012 tourist season. According to Smith Cruise tourism contributes significantly to the economy of the Virgin Islands. It seems that Massimo Garbarino, captain of the Costa Luminosa and formerly captain of the Costa Concordia, just made manouvre close to Island of Giglio, as demonstrated by a corrispondence with the mayor of island of Giglio Sergio Ortelli. Francesco Schettino, captain of the Costa Concordia at the moment of the accident on January 13rd 2011, declared through his lawyer Bruno Leporatti Costa Cruise were informed about the usual practice of “near-shore salute” , also operated to promote the brand Costa. So wrote the mayor Ortelli August to the then commander of the Concordia Massimo Garbarino Callisto. The email was posted on Giglio News.